There are new vehicles coming out all of the time but not all of them are special. If you are searching for a mid-size pickup truck, you want to pay attention to the new one that Ford has released. The 2019 Ranger is well-designed and truly something worth noticing. It is important for your truck to be off the ground, for it to put you high in the air when you are driving it so that you can see all around you. 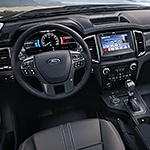 The 2019 Ford Ranger features a design that offers you high ground clearance. There are standard wheels that you can stick with for the new Ford Ranger that are cool and that add to the look of the truck. There are exceptional wheels that you can add to the truck if you want to make it a little more special. There are many wheel options to choose from.